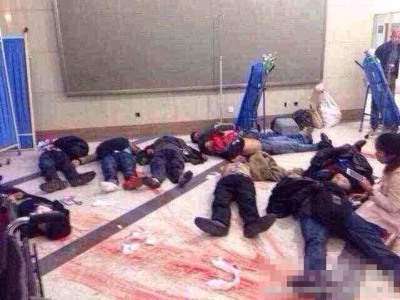 Twenty-eight people were killed today in a terrorist attack at a southwest China train station. Five suspects were shot dead in the attack. At least one report identified the attackers as Uighur Muslims. Twenty-eight civilians were confirmed dead and 113 others injured Saturday in a railway station attack in southwest Chinese city of Kunming, authorities said. It was an organized, premeditated violent terrorist attack, according to the authorities. The authorities also said five suspects were shot dead but their identities have not been confirmed yet. A group of knife-wielding people attacked the Kunming Railway Station in the capital of southwest China’s Yunnan Province at around 9 p.m., causing death and injuries, said the city police. A Xinhua reporter on the spot said several suspects have been controlled, while police are still questioning people in the station. The reporter said that firefighters and medical workers have arrived on the scene, and injured people have been rushed to hospital for emergency treatment. The arterial road of the station has been cordoned off. A doctor with the Kunming No.1 People’s Hospital told Xinhua over the phone that medical workers of the hospital are busy treating the injured, adding that they are still unsure of the exact number of casualties. According to Xinhua reporters at the hospital, a dozen of bodies were seen at the hospital. As of 0:00 a.m. Sunday, more than 60 victims in the attack have been sent to the hospital, emergency registration records showed. Chen Guizhen, a 50-year-old woman, told Xinhua at the hospital that her husband Xiong Wenguang, 59, was killed in the attack. “Why are the terrorists so cruel? ” moaned Chen, holding her husband’s ID card in blood with her trembling hands.